We are busy packing boxes of shuttles and bobbins as well as many other goodies from our retail store. 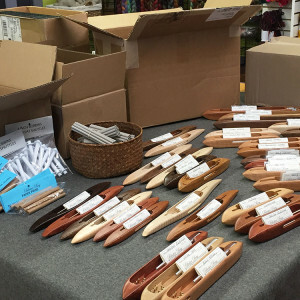 Shop with us in Coeur d’Alene, Idaho at the Log Cabin Fiber Arts annual event at the Kootenai County Fairgrounds from 9:00 AM until 5:00 PM on Sat. March 19. We’ll have a vendor booth there under the name of our retail store, Blue Flag Handweaving. Please stop by if you are in the Spokane or Coeur d’Alene area!